This post was written by The New York Foundling and originally appeared on www.nyfoundling.org. 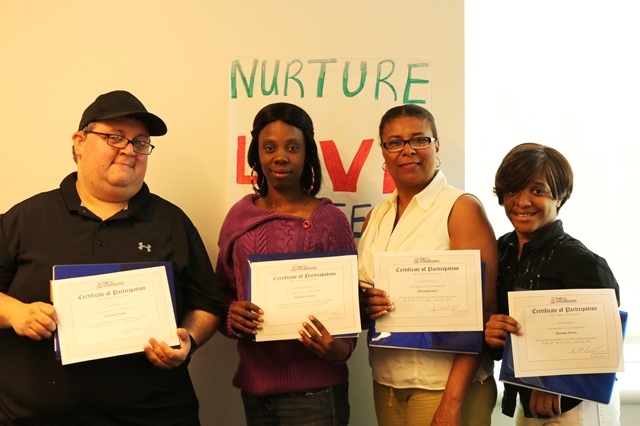 Four parents receiving services through The New York Foundling’s Deaf Services program graduated from the first Parenting Journey workshop adapted especially for the deaf community. The participants, whose children ranged in age from infant to young adult, attended the once-per-week sessions over 12 weeks. During the sessions, they were able to reflect about themselves, learn new parenting skills, practice techniques such as guided meditation, and talk about how to make informed choices in raising their children. Topics for the course included: Honoring Yourself, Personal Inventory, Picture My Past, Relating Parents and Children, Secrets and Fears, Honoring your Child’s Identity, Making Choices, and Setting Goals. For the activities, participants shared a special object that held meaning for them, drew a picture about a significant early experience for their children, and wrote a letter to their parent and/or caregiver. This was the first time this workshop had been adapted for participants who are deaf or hard of hearing. Deaf Services Clinical Group Supervisor, Luba, guided each week’s activities using American Sign Language. Deaf Services organized the workshop after recognizing the lack of parenting courses available to the deaf community. Luba attended the Parenting Journey facilitator training specifically so The Foundling could adapt the model for its clients. Patricia says she would recommend the course to anybody looking for or in need of the resources. Because of the group’s success, The Foundling’s Deaf Services team has plans to form a second course with new participants. To learn more, or to join the next group, contact Luba Douziech at 646-350-2710. I am looking for training videos in Sign language for new parents or soon to be new parents. I would like things on what to expect while pregnant, early child development and labor and delivery. Can you point me in the right direction? Brenda, Thanks for your message. Have you tried reaching out to The New York Foundling yet? Their website is http://www.nyfoundling.org.